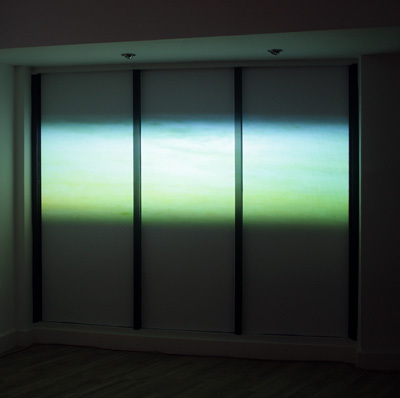 ‘Green meadow’ is a generative audio-visual work modelled on the behavioural patterns and progression of physical environments and their unpredictable self-similarity. The often soothing and hypnotic sensory power of naturally occurring systems, such as the repetitive crashing of waves on a shoreline, the rhythmic drumming of rain on varying surfaces or the simultaneous rustling and creaking of trees in the midst of a forest, are aesthetic variations of the same underlying chaotic structures. The reoccurring of the micro event in succession or seeming parallel, however never as a reproduction of the preceding but rather as an adaptation of the same, thus determines the organic attractiveness of such environmental sound cluster or visual spectacles. Systems like these, can, with the increase in energy, freely vary from the soft and soothing to the overwhelming and daunting. They are however tightly confined within the structural boundaries of the underlying physicality producing the event itself. A tree can be motionless, sway or break in response to outside force, and while it can produce an infinite number of variables within the boundaries of its behavioural pattern, it cannot sit down and play the harp. Progression or change are rather produced by the improvisational freedom of the system itself to respond to its own variables, resembling a dialogue between the increasing or diminishing force of the system and its structure. ‘Green meadow’, in its compositional variation, concerns itself with the texture and density of the moment, rather then the arrangement of its past or future. Like its natural prototypes the artistic construct is non-durational, or without a time line. Individual events, progression and change within the work are stimulated by the interplay and cross-influence of its individual components. This means, the currently occurring audio-visual events interact continuously to determine their own future. As an abstraction of reality ‘green meadow’ thereby strives to represent the improvisational freedom of nature, and can be seen as a form of organic compositions. The works acoustic properties are based on the recorded sample of a breath of air, chosen for its representational properties of almost inaudible airflow as well as its organic similarities in texture and frequency distribution to white noise. Both of these attributes are synonymous with potential and possibility. The movement of air, however subtle in times, is one of the predominant forces of life in any ecosystem. Representational in its largest scale for the existence of an atmosphere, down to the simple disclosure of presents through movement, airflow is an indicator of existence. Through its acoustic correlation to white noise, the breath of air bares within its subtle consistency the possibility of all audible frequencies. The prospect of extracting these at will, lends it the invaluable property of a raw material containing a multitude of possibilities. Like the prime tool of evolution, the error, or in this case digital glitch, is used as a deliberate tool to extract frequencies out of the pool of ‘noise’. The delicately changing properties of the breath immediately surrounding the glitch, thereby lend an ever-changing uncertainty to the audible grain of the frequencies extracted. The single events responsible for the glitch frequencies get triggered in a manner defying the detection of perceivable rhythmic structure. Far from random however the prompting of these acoustic events is determined by the intersection of parameters within the underlying structure of the work. The overall cyclical nature of the piece thereby ensures that the history of past events within its overall structure determine the potential of its own future. Microworld Cardiff 2 was an art show at The Arcadecardiff Gallery in May 2014. The show was part of the Microworld project by Genetic Moo, and an experiment in creating a living digital ecosystem where many different art works interacted with the audience, the space and each other.